The Purple Scarf: Celebrity Style: Emmy Style! Heya! So in case you didn't know, the Emmys were on last Sunday night. I'm generally too busy to watch a 3 hour long rewards show. I usually just catch the highlights the next day on YouTube. But I do love to watch the Red Carpet Pre-Show. Seeing all the glamorous people dress up and wear amazing gowns, gowns that I could never afford! It's also a good way to spot the upcoming trends that the rest of us will see in stores very soon. A few trends I noticed on The Red Carpet, were lots of jewel tones like bright purples, cobalt blues, and emerald greens. There were several pastel blush coloured dresses as well. And it seems that crop tops and showing your stomach is still in style as well as lace and leather detailing. Black and white combinations look like they are still going strong and the sheer long skirt overlay looks like it is here to stay, at least for another season. My pick for best dressed is Kaley Cuoco with runner up Kerry Washington. I love the ruffle details and bustier on Kaley's dress, and the colour suited her. Kerry's dress was just breath taking with the flower and lace detailing. 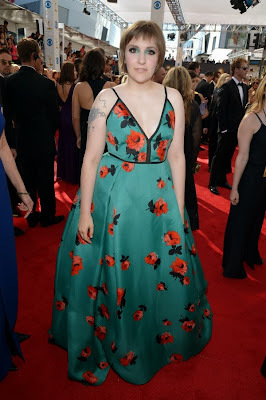 My pick for least favourite dressed is Zosia Mamet followed with runner up Lena Dunham. Zosia's dress would've been fabulous if it wasn't for the awful leather and sheer bib. Lena's dress did not look good on her at all. Which celebrity dress was your favourite? Which one was your least favourite? I would love to know! And P.s! 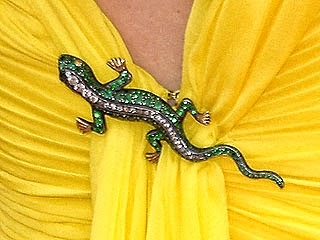 : My favourite accessory of the night in Anna Farris' lizard brooch on the back of her dress. What a fabulous p.s!